Settle for nothing less than the fullness of your God. We long to live a life that really counts. But often, we don’t know how. Too many people in this generation live an aimless, purposeless existence—lacking direction, focus, and passion. We desperately seek answers to the riddles of life…Why am I here? What am I supposed to be doing? And how am I supposed to get it done? When God Writes Your Life Story helps you tackle these daunting questions. It provides a practical roadmap into the boundless potential of a Christ-built life. It’s more than a book about finding your purpose, it’s about the life-altering effect that God—the Author of adventure—can have upon your purpose. Whatever happened to historical, world-altering Christianity? This book seeks to introduce you to the heroic existence of Christians in history past. Eric and Leslie believe that the Christian life isn’t meant to be dull and predictable, but the greatest adventure of all time. Highly motivational yet extremely practical, When God Writes Your Life Story features a hands-on Field Guide section, highlighting the seven landmarks of a God-scripted adventure to help you reach new heights in vital areas such as goal setting, personal development, and spiritual growth. For a generation longing to live a life that counts, this book opens a whole new world of possibilities. 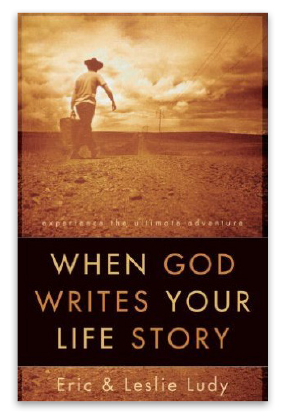 Get ready to discover how breathtaking the adventure can be…when God writes your life story. This book is great for all ages.